We all know cough syrup isn’t the best-tasting medicine. That’s why medicine companies have been introducing better-tasting concoctions loaded with sugar to help the medicine go down. Buckley’s is finally entering the US market and they aren’t backing down from their “tastes awful” positioning. TV spots include faux taste tests with blindfolded consumers asking them to tell the taste difference between Buckley’s vs. Used Mouthwash, Buckley’s vs. Trash Bag Leakage, Buckley’s vs. Public Restroom Puddle. Seriously. Click on the above links to watch the short commercials. 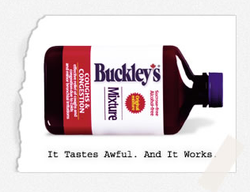 Buckley’s is also into the Consumer-Generated Media game asking people to submit videos of their first sip of the malicious cough mixture with their Bad Taste Tour contest. Troll YouTube and you’ll also see videos of people trying Buckley’s for the first time. I applaud Buckley’s for accentuating the hate with their cough syrup. The easier path would have been to reformulate the cough syrup to taste better so as not to turn off customers. But by turning off customers, Buckley’s turns them on. Kudos to Buckley’s. And Kudos to the Wall Street Journal for the heads-up. It's amazing how what we perceive as a risky choice, is actually the best choice. So often in marketing, we attempt to add more to a product or service, to a point of changing it's true appeal. It actually makes marketing professionals appear to be more of magicians than practicians. By simply telling the truth and being proud of it, this company can focus its R&D more on improving the medicine than covering it up with taste. Let's face it, people would rather temporarily taste something bad, than feel bad for the rest of the day. I think this is a wonderful concept, and I wish I could tell the truth like this with my clients. Whoever sold this concept is a smooth operator, and a genius. This is why I love this business! It's all about good ideas and the execution of those ideas, not about how much money you spend on it. Inspiration for other marketers to open up the paths to creativity! Listerine has used this tactic for years... They had their tagline "It's got the taste people hate, twice a day"
"I've tried others but they don't taste as bad - so I stick to Listerine... If it didn't taste so strong, it wouldn't be working... If I didn't hate it, I wouldn't use it." I laughed out loud in my office when I read the radio ad ... now that's funny! Their straight-on, no nonsense approach reminds me of Zenith's campaign (probably 10 years ago), "The most expensive television on the market ... and darn well worth it." No apologies. Just the authentic truth. Plain and simple. I love it. I saw this Ad today on televsion and wow are they so correct. What a way to generate buzz and guess what...everyone knows that this stuff tastes horrible! I wondered "what the...?" when I first saw the commercial with the "public restroom puddle." And, you know what? The next time I get that terrible hacking sounds like I'm going to throw a lung across the room cough - I'm going for the Buckley's! Too many company's try to be everything to everyone. If your stuff tastes bad but works, so be it. As a branding agency we tell our customers this all the time. Being different is a good thing. These comments are all well and good but, obviously, none of you have ever tried this stuff. I can't begin to describe just how bad it tastes. The only reason it works is that your body will do ANYTHING to keep from having to taste it again. I tried this and it made me physically ill. I opened a new bottle took a swig and about 1/2 later it came back up. I was unable to leave my bed for 2 days. Needless to say I threw the bottle away. Delsym is a much better tasting effective cough medicine but the store was out so I picked this. Do not make the same mistake I did. I tried everything for my cough and as a last resort tried this stuff. It smells like cat pee mixed with Vics Vaporub, and tastes even worse. Almost at once, my cough stopped and my nose unplugged. I was able to go right to sleep and stayed clear all night. It's not for everyone, but I'm a believer now! I dont see the point of the "if overdose suspected, call poison control immediatly" who the hell is gonna OD on that stuff!! But I also swear by it It works! also helps with kids who like to "pretend sickness" threaten some buckley's everyone feels better real fast!